1 Kreuzer, copper: OB: GEFURSTETE GRAFTSCHAFT TIROL (Princely County Tyrol). Crowned, spread eagle of Tyrol with laurel wreath around the head. RX: EIN (1) KREUZER 1809 within a wreath consisting to two different laurels. The edge has a floral pattern. Varieties exist, any help identifying those and documenting them would be appreciated! Craig 41. 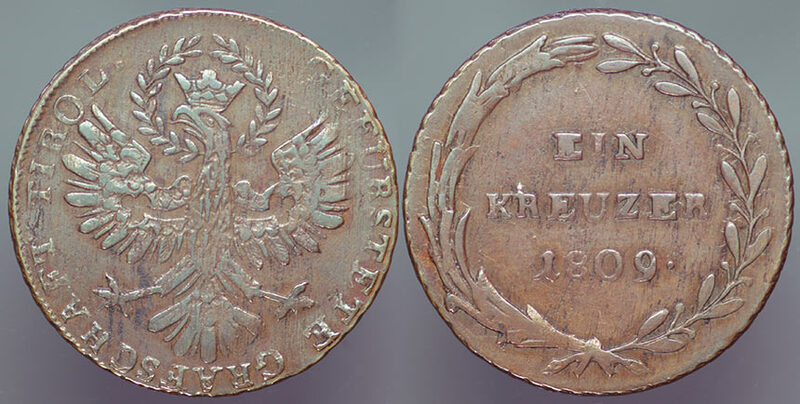 For my history of Andreas Hofer and his Rebellion coins: please email martinj481@gmail.com - I'll email the illustrated file.